The paper by the CSIRO compared five drainage scenarios with a baseline scenario, which outlines what is expected to happen in the Blackwood Basin in terms of variables like groundwater levels and salinity in this century should the climate of the past 40 years continue. The findings are based on a modelling study using historical climate and likely future climate data. 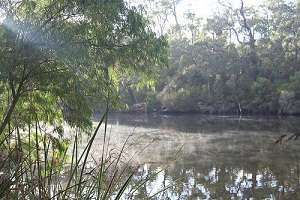 The Blackwood Basin has been experiencing long-term increases in groundwater levels as a consequence of large-scale native vegetation clearing in the past two centuries. The clearing has led to increased stream salinity and land salinisation. Only one of the drainage scenarios was found to be able to improve the health of the Blackwood Basin compared to the baseline scenario – the Evaporative Basin (EB) model. CSIRO Land and Water Principal Research Scientist and lead author Riasat Ali says the EB model assessed the feasibility of constructing evaporation basins at the outlet of each of the 111 subcatchments in the basin to store drainage discharge from an artificial drainage system. Under the EB system, stream salinities were projected to reduce at all subcatchments by at least 30 per cent, and up to a maximum of 61 per cent in the Beaufort River. Mean annual flow at all sites was also projected to reduce, while it was found there would be substantial reductions in overflow frequencies across the basin. This is compared to the baseline model, which found that the long-term impacts of doing nothing – that is, having no artificial drainage or salinity management strategies in place – would result in increases in streamflow and salinity. There would also be continuing increases in average groundwater levels and increased overflow frequencies. "All drainage discharge management strategies, except discharge management by evaporation basins….are likely to have adverse impacts on the lower Blackwood River from higher salinity levels than are expected under the baseline scenario," Dr Ali says. "This [EB] strategy was assessed as infeasible economically due to prohibitive construction and maintenance costs of evaporation basins," Dr Ali says. Dr Ali says any future regional drainage scheme in the Blackwood Basin could use the findings of this project to select options which were both technically and economically feasible. The research project was completed as part of the Engineering Evaluation Initiative, managed by the Department of Water.